When I watched Black Panther the other day, like other audience-goers, I was blown away. Everything about the movie was incredible, from the plot to the characters, from the acting to the music. It was an incredible experience. I think the main reason there are so many people going back to watch it again and again though is more than it being a beautiful movie, it’s because it’s a clear game-changer. Hollywood has a tendency to find one aspect of a film and cling to it as its reason for success, or its reason for failure. “An all-female comedy fails? It must be because nobody wants to see an all-female comedy.” I worry that Black Panther will be treated the same way. “Oh, a majority black cast in a superhero movie got this much love? That must be the key to producing another just like it!” This mindset could lead to a series of copycat films, all trying to be the next Black Panther, entirely missing out on what made this film so groundbreaking. What makes Black Panther incredible is the respect that it shows. It gives a nod to both African cultures and traditions and to the dysphoria that many African-Americans feel about their country. There has never before been a film that has not only acknowledged the pain of having your culture stripped away from you, but also admitted to the anger and resentment that causes. Black Panther handles both with grace and elegance all under the guise of a superhero film. It found a way to express that pain while still being consumable by audience members aged 13 and above. That kind of clever balancing act is tough to beat. And while I’m hoping that this film will herald a new series of all-black casts with major funding and box office pull, I worry that taking away only that lesson will lead to this being a phase instead of a new era in films. As a movie goer who would love to see more unique ideas and even more diversity in Hollywood, I still can’t help but be worried. I’ve seen subcultures be used as trends in films before and I would hate to see the power and dignity of Black Panther be wasted by Hollywood executives eager for a quick buck. I’m a professional woman with a full-time job. Tonight I’m going to see the midnight showing of The Hobbit: Desolation of Smaug. Some people think these two statements don’t go together. For some reason folks have a hard time believing that an adult with a full plate of responsibilities would be interested in taking time off to go to a midnight showing of a movie, not to mention a fantasy film. Aren’t there more important things you could do with your time? Couldn’t you just wait to see it at another time? These aren’t questions that are always stated, but I can still see them in the curious glances and the odd looks I get. People tend to be shocked when they find out that I’m such a big Lord of the Rings fan, at least until I start talking about it. This seems as good a time as any to explain why I have such an obsession with this franchise, and more specifically, the Desolation of Smaug film. I have to credit my discovery of The Hobbit from watching the Rankin/Bass version. I absolutely loved the songs, the animation, and all the little character quirks. It was a movie that I grew up with and one that I still rank up there on my favorites list along with How the Grinch Stole Christmas, The Last Unicorn, and Flight of Dragons. It was a fun film as a child and as I got older I realized how rare and wonderful it was. I’m pretty sure I read the book sometime before I got assigned to read it in High School, but I can’t say when that was exactly. I can say that it was one of my favorite reading assignments. It was a topic I could definitely write about. My mother was an elementary teacher. Often I found myself in her classroom helping her clean up or wasting time while she finished getting her classroom and paperwork ready for the next day. I’m pretty sure this was common for teacher’s kids. You just get really used to being at school. I was reading the Hobbit for maybe the second time, and I was going through a phase where I was asking all my sisters the riddles that Gollum asks Bilbo. It was fun to watch them try to figure it out, much as I had when I first picked up the book. It was only natural to follow this fun with writing a riddle on the board for my mother’s class the next day. They were a group of fourth graders and all of them were curious and confused at the same time. They spent a few minutes at the beginning of class each day while the kids puzzled over what the answer could be. I’m certain my mom helped them out, she did have a class to run after all, but she thought it went over so well that I should put up another the next day. It didn’t take us long to run out of riddles, and we couldn’t find any good ones really online, so we did the next best thing. We started pulling out quotes from the book and put them up instead. It only lasted a few weeks, but the kids in the classroom loved it. It’s cool that they got to try to unravel some interesting word puzzles. Most of them had likely not read The Hobbit, so they were really at more of a disadvantage than I was as the reader. After all, I could just glance at the next few lines to see the answer. Some of the riddles were tough too. I like to think that a few of those kids looked at words a bit differently after that. When I was a kid, I would go exploring through the woods in our subdivision all the time. My sisters and I spent a good chunk of our childhood in the woods exploring, building forts from sticks, and just getting into trouble. The idea that a disease could come across an entire forest, causing a species of enormous, dark creatures to turn it into their new home intrigued me. The fact that they took the form of giant insects was just downright frightening. That isn’t the only adventure Bilbo has in Mirkwood though. He also has to deal with the wood elves, King Thranduil’s people, who are terribly mischievous. These scenes are reminiscent of fairy lore in how Bilbo is never sure how much of what he’s seeing is real or not. When you do finally meet the people, they aren’t at all how the typical elves are portrayed. Their elven guards don’t always do what they should and the frequent parties cause many to indulge perhaps too much in wine. They are in many ways counter to the typical view of elves. They are more hunters than magic wielders like the otherworldly elves of Rivendell or Lothelorien. They rely on stealth, speed, and guerrilla tactics; which honestly made me like them all the more. After all, those were the same tactics I might use. King Thranduil is an especially interesting character. There are some in-depth character analyses of him if you’re interested. He is really just as much a villain as Smaug, but he walks that line quite carefully. He has a multitude of reasons for why he does the things he does, definitely moreso than Smaug does, but that certainly doesn’t make his actions less cruel. He’s what I would call a “lovable bad guy”, or any bad guy who doesn’t quite fit the mold. Severus Snape from the Harry Potter is the first character that comes to mind, but there are dozens more. 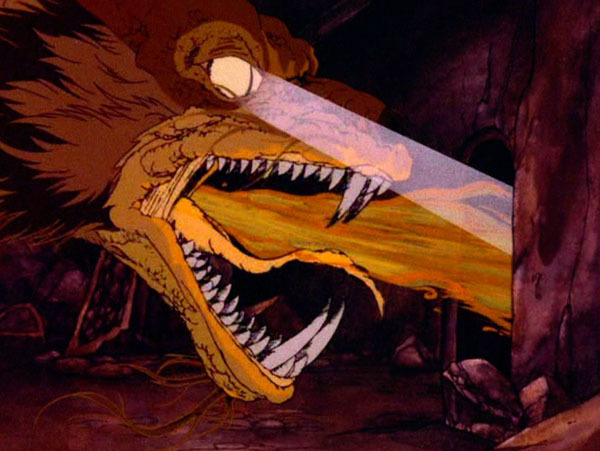 It’s difficult for me to explain the impact Smaug had on me, being so little when I first watched the Rankin/Bass film. He was unlike most of the villains you saw at the time, and didn’t seem cruel simply for the sake of being so. He was arrogant and greedy, yes, but he was also undeniably clever. If he was allowed to keep what he had stolen, he would have been a rather quiet neighbor. There is a great build-up of Smaug in the novel as this powerful foe, and maybe a few mentions of his keen wit, but it wasn’t revered to the same level as his fire, his ferocity, and his strength. Indeed Smaug shows how dangerous he is not by murdering thousands, not by destroying buildings, and not by burning people alive; he does it through speech. That doesn’t mean he hasn’t done these terrible things, and they are mentioned, but really you don’t see Smaug in his true fury until he speaks to Bilbo. You realize quickly that it is good that Bilbo is so very familiar with riddles because Smaug is the ultimate riddle. He is described as a one-man army, yet a common thread in the book is that looks and first impressions can be deceiving. He is a foe who has to be cracked with quick words and a sharp mind, not with anything so basic as a sword. He was perhaps the first intelligent, well-spoken, clever enemy that I ever saw, and I absolutely loved him for it. To be fair, The Hobbit itself is not a perfect book. Tolkien wrote it for children, and so it leans more on the comical side compared to The Lord of the Rings trilogy. When I was younger, I adored it specifically because it was so very accessible. I couldn’t get through the Rings because it required a different level of concentration, and The Hobbit made for an excellent fantasy gateway drug you could say. Tolkien considered several times writing a more adult version of it, but I believe friends like C.S. Lewis talked him out of it. A second book on the same story, even if it was in a different style, would be overdone and simply felt repetitive, though today many wish he had written it. Battles happen in The Hobbit, but you don’t really get to see them. You get to see the skirmishes that Bilbo takes part in, but since it is geared for children and Tolkien had seen war, it is completely understandable why he didn’t want to include it in the book. However its absence is keenly felt. It almost feels like a let-down that you aren’t inside the battles like you are in Rings. You know the battles happened, you see the damage and the fall-out, but since you aren’t a part of it, you can feel the censoring. Even kids can pick up on a missing part of the story. Even still, The Hobbit is one of my favorite books, perhaps the favorite. I still love it even for all its flaws and weirdness. Even with it’s strange gaps and multitude of characters. As a writer I’ve learned that there is no such thing as a perfect book. It’s going to have problems. A book is a child of carefully molded love, and since people come with their own flaws, so do their creations. So when someone asks me why I’m going to a midnight showing of Desolation of Smaug tonight, I’m going to explain how much the book has meant to me. I’m going to tell them how much I love how the creepy forests of Mirkwood, the caustic King Thranduil, and the silver-tongued Smaug. Or maybe I’ll just save myself the trouble and point to this post.